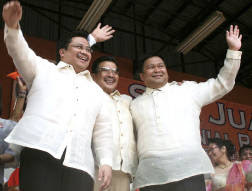 Political families thrive in all but one province in the Philippines. From Batanes to Tawi-tawi, with the exception of Kalinga, members of political families hold public posts, both elective and appointive. In a recent study, GMA News Research has identified at least 219* political families that dominate the countryâ€™s political landscape. Some of these families entered politics as early as the birth of the Philippine nation, like the Aquinos of Tarlac, Laurels of Batangas, Lacsons of Negros Occidental and Manila, Aguinaldos and Abayas of Cavite, and Duranos of Cebu.